I am so excited for this to be my first CHA release as an artist for Impression Obsession! I hope you'll love these stamp images as much as I do. This is one of the bird collage images (Bird Collage 1) - I stamped it in chalk ink, sponged in the oval aperture, then used some mulberry roses to embellish the image. The sentiment can be found HERE and the striped banner it's stamped on is a new stamp from Alesa Baker. Be sure to stop by tomorrow to see more new images, and if you like my stamp designs, stop by and 'like' dkdesigns on Facebook! Gorgeous - love the collage and the colors you used. Dina, beautiful card! I especially like how the bird image is the focal point, yet placed in the background. Very interesting, and will try that myself! The Dream image on striped paper looks great! Your custom background is gorgeous! Really pretty card! Love that bird image! Beautiful card. Love the bird stamp! First your background : superb, love it, want all the stamps so I can make backgrounds like yours... Second the bird stamp : I am NOT a bird person, so far I have resisted the enduring fashion of birds in the craft world... but this one, and its sort of negative cousin...I feel I might crack ! This is gorgeous and I just love the colors you chose. Really like the card....the colorful ticking gives it a real vintage look. And of course, love the bird! Congratulations on your IO stamps! Your artwork is always picture perfect and your designs inspirational! Simply gorgeous! Love the flowers along with this pretty image. Great use of the lace too. WOW!! Dina this is so beautiful!!! Very lovely card, thank you so much for sharing it. love the colors. Love the new Ticking stamp....so reminiscent of comfy old pillow cases. Sooo pretty card!! Beautiful card! I love the framed bird and your background is awesome. I am really enjoying the stamps you have come out with, loved all of the summer/nautical stamps. Thanks for sharing! Beautiful card- love the bird image and the lovely black fiber around the oval. The sentiment panel is an awesome touch! Here goes again: Fab card--love the rich colors. So, I am trying again: Great card--love the rich colors, image, & embelishing. Very pretty! Very rich colors! Beautiful image! I love the colors too! Your accents perfectly high-light the image. Love the bird-beautiful card as always! Your work is fabulous as always, Dina, and I'm really loving the stamps you're designing. I'm just catching up on Day 1 and 2 of the blog hop that I seemed to miss. But congrats on your new design release. Really elegant! And I am excited to see what all the other girls have done with them. very pretty, love the lace bow with the image, great colors! Oh my, this card is so pretty - a work of art! 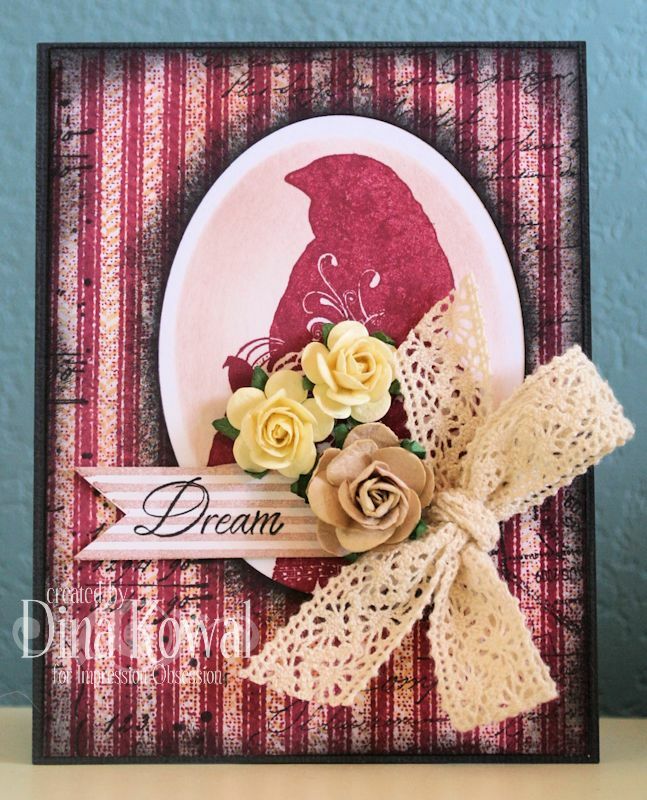 I like the vintage look you've created, and I too like the stamping on the striped paper!